Reader Comments: A wonderful new facility for the NYC area with its one of a kind location. 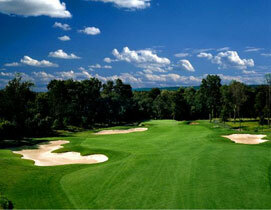 The course is beautifully maintained and the practice area is top notch. Overall this is a good looking golf course. Unfortunately quite a few of our readers felt that the layout is not particularly interesting, with few memorable holes, and most of the others all looking very much alike. Most of the complaints however, were about the price. Nice, challenging course but not worth the money. Extremely pricey. Golf course is OK....price ridiculous. Description: The fully-public course at Royce Brook (the West course, part of the same complex, is private) is a beautiful parkland-style layout, that is kept in the kind of shape expected from it's private compatriot. Although moderately new, the routing of holes through the trees and on the rolling terrain seems natural and flows with ease. 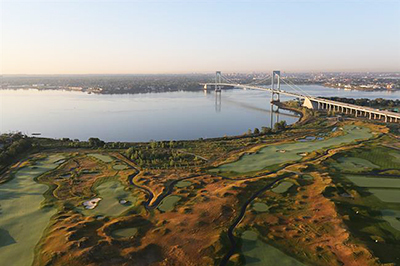 Although there are many trees and wooded areas, the course also features wetlands and wild native grasses that make for a very interesting juxtaposition with the abundant trees. Most of the bunkers -- and there are more than a few -- are large and shallow, and feature a white sand that make the place aesthetically pleasing. The fairways are generally wide, with some bunkers that are cut into the flatter, sweeping terrain. The greens are moderately sized, and with the speed they're normally kept at, the subtle undulation can be a real protector of par. Although the West Course gets quite a bit of acclaim, the East is less punishing and is more playable for the average golfer. Reader Comments: Tough, but not so punishing as to where it feels like torture ... Always kept in great shape. One of my favorites anywhere ... The best public course in the New Jersey ... Really feels like a private club, both with the atmosphere and staff, as well as the terrific golf course.